Football playing robots built by researchers at Eindhoven University have lost the final of the Robocup World Cup 4-1 to a Chinese team. The Dutch team, with players such as Robodinho, were defending champions and beat the same Chinese team, named Water, in 2014 and in 2012. The Chinese won the event in 2011 and 2013, when they also faced Tech United in the final. 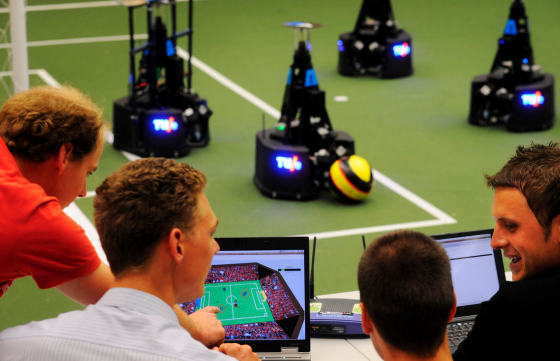 The robots play independent football and are not controlled by humans during the game. The Robocup competition was launched in 1997 with the aim of stimulating research into robotics and artificial intelligence.